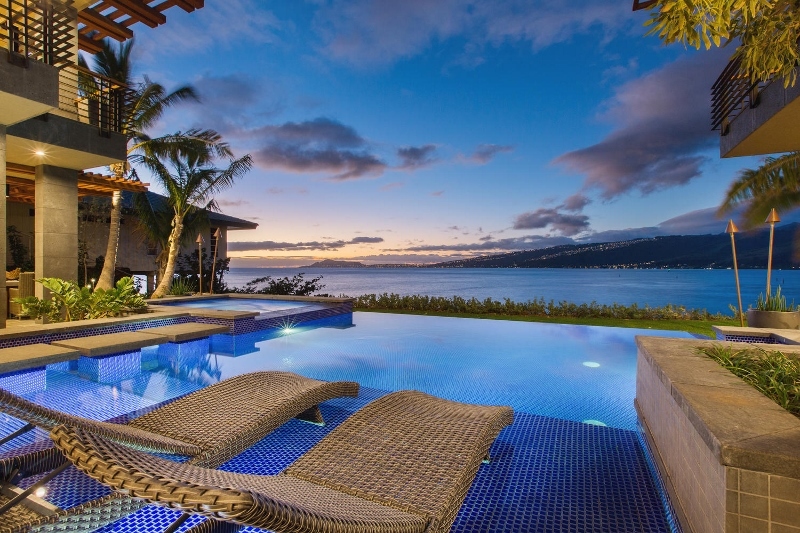 Ocean Estate – Luxury Vacation Homes, Inc. 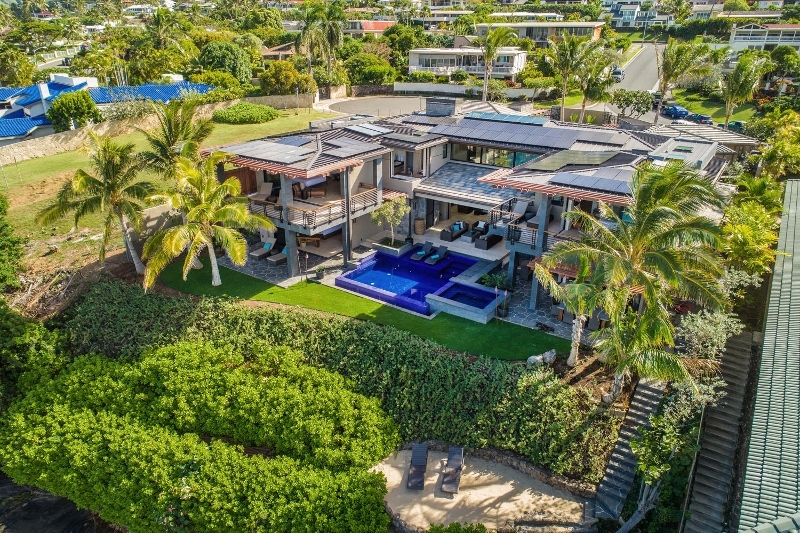 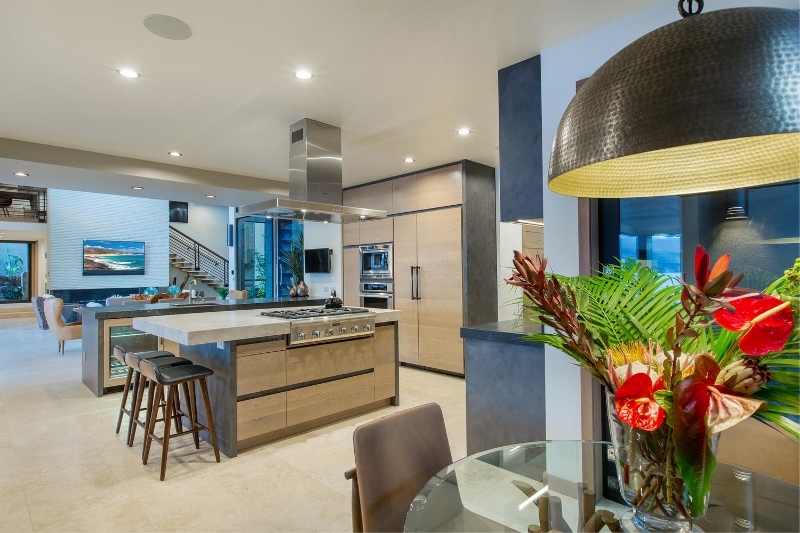 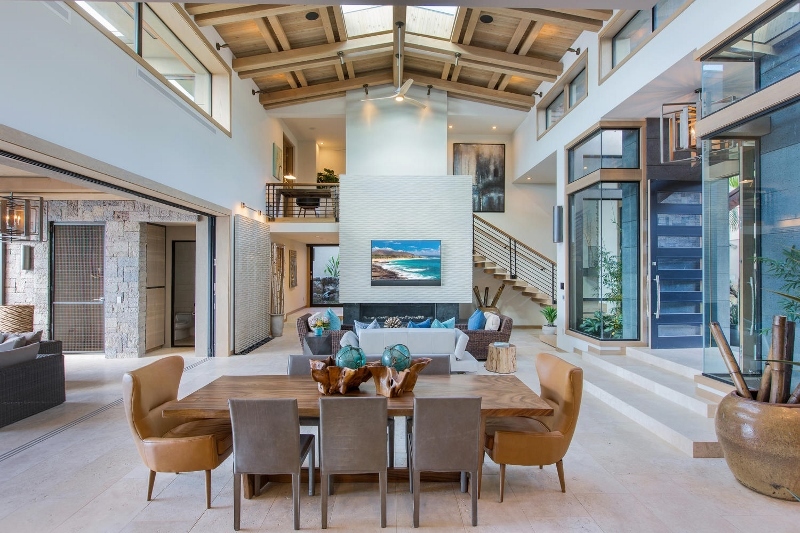 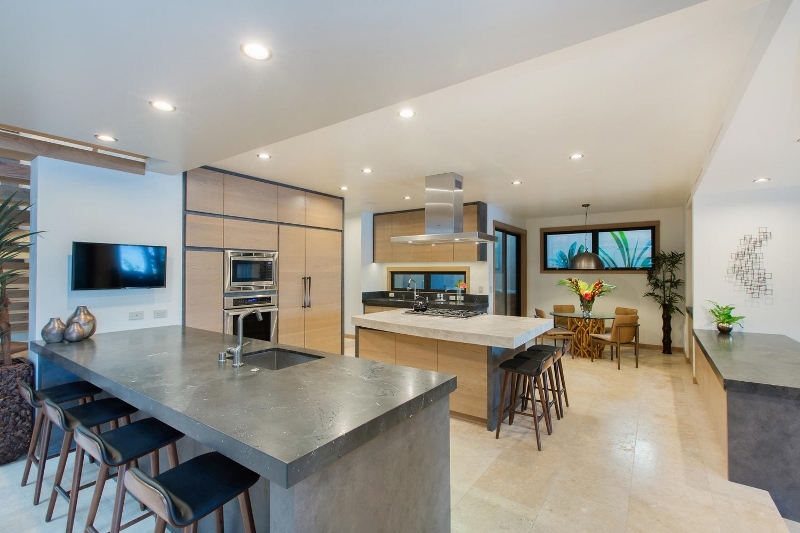 Ocean Estate is the newest residence in the collection of ultra-luxury homes designed by renowned Hawaii Architect Jim McPeak and built by San Diego based developer Mark Gosselin. 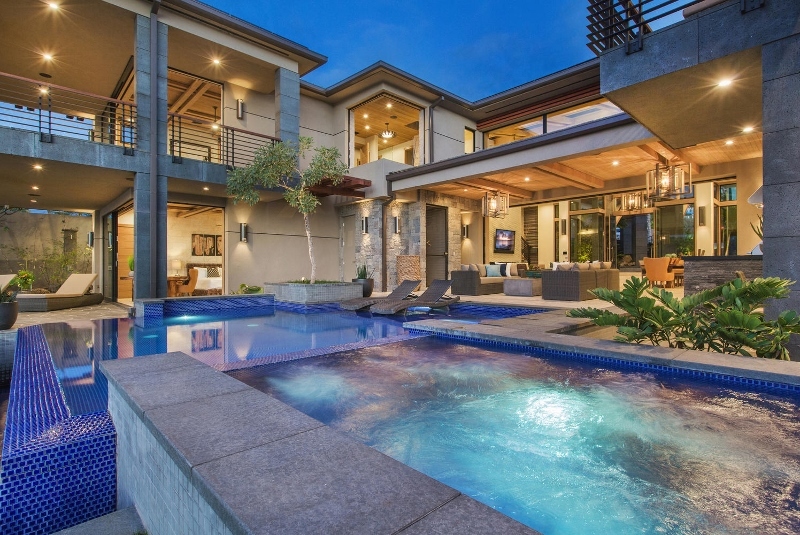 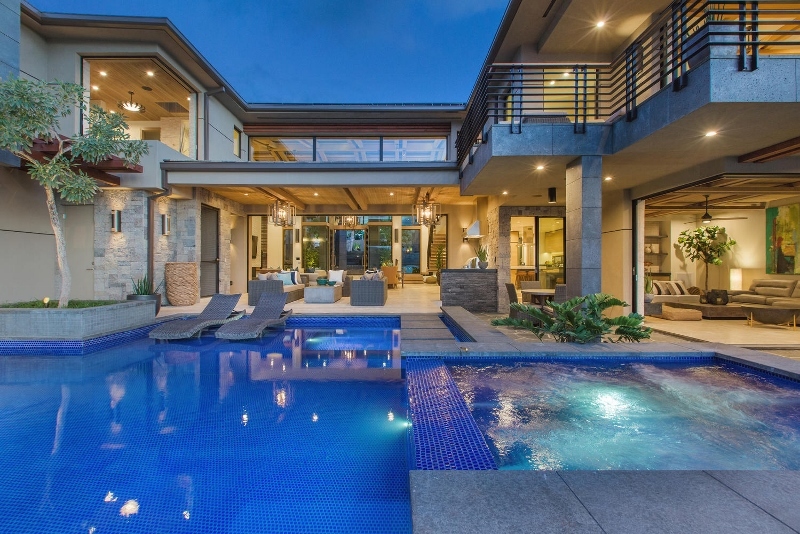 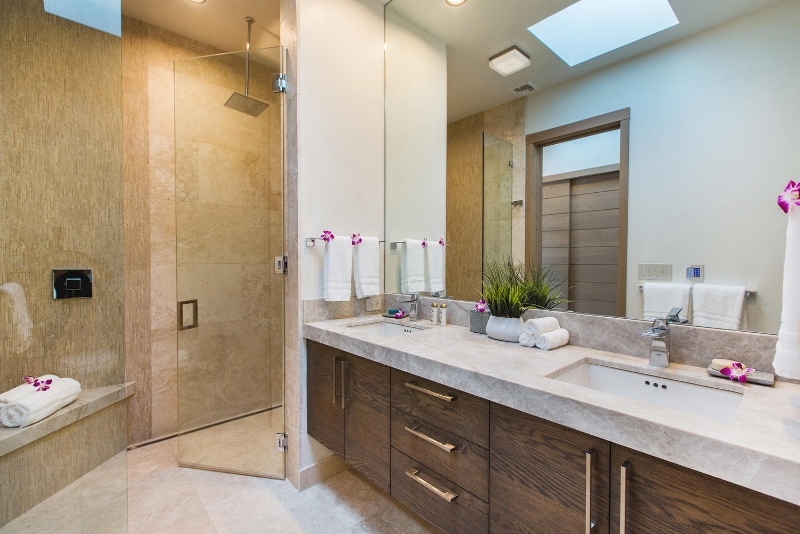 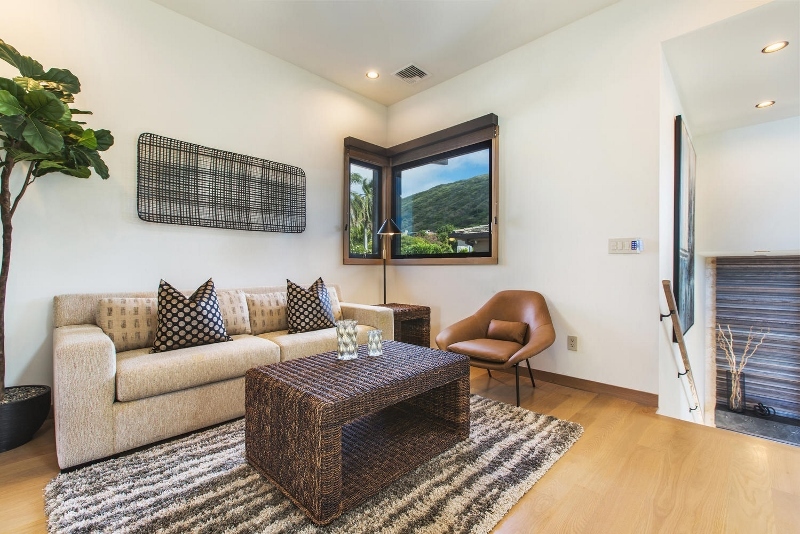 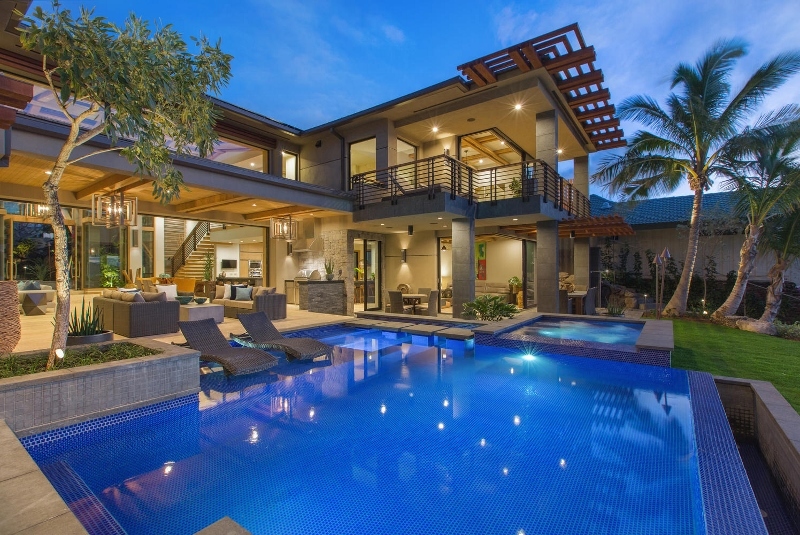 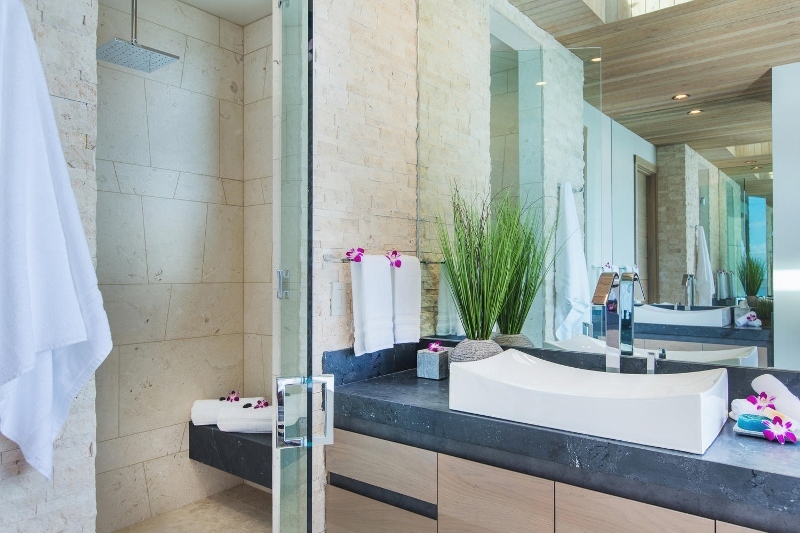 This estate is a modern take on Oahu’s well-known Banyan Estate. 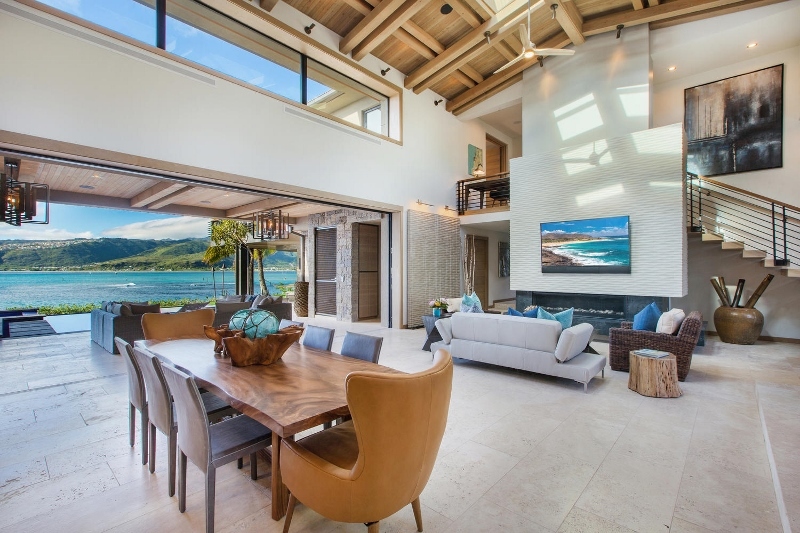 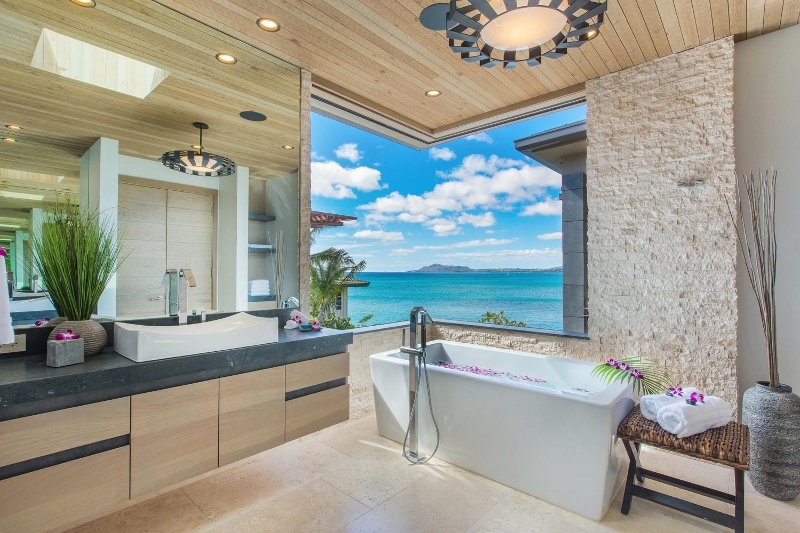 It captures a similar style of oversized, grand spaces all centered around the stunning ocean view. 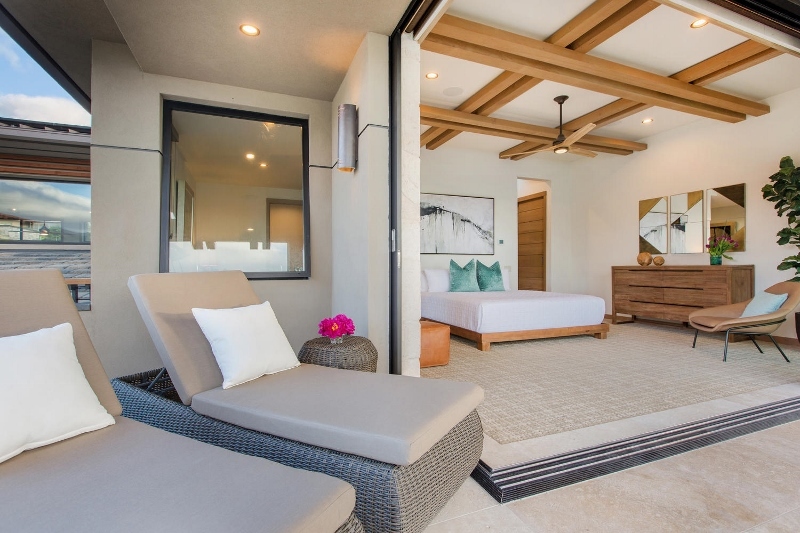 With three ocean view suites, each room affords it’s own level of comfort and privacy. 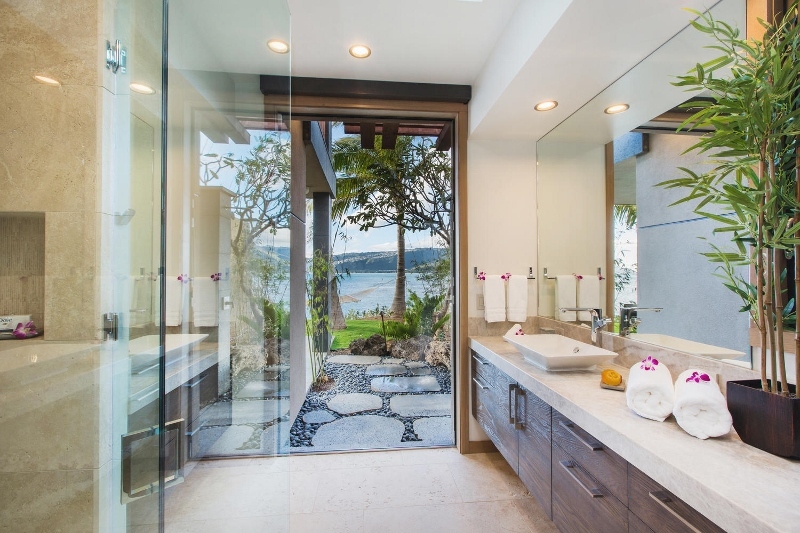 Each bedroom is spacious with its own ensuite bathroom. 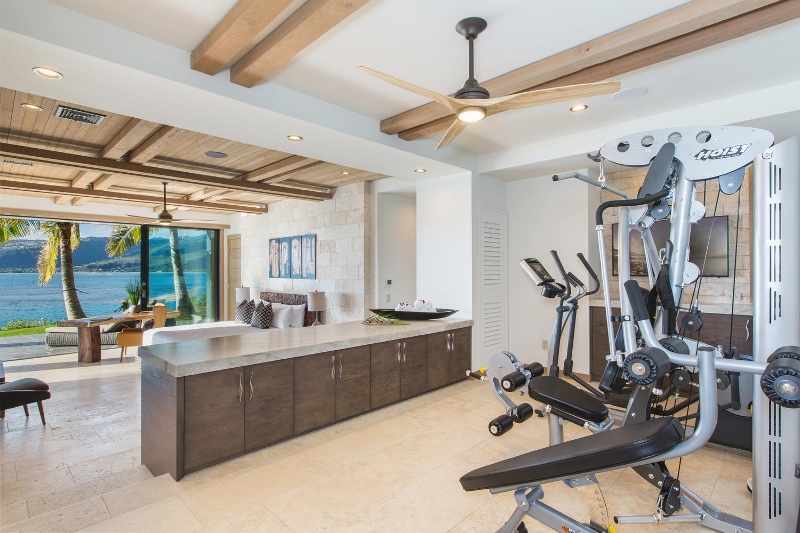 The upstairs master has its own sitting room with a desk and the downstairs master has an extended split-level room with gym equipment. 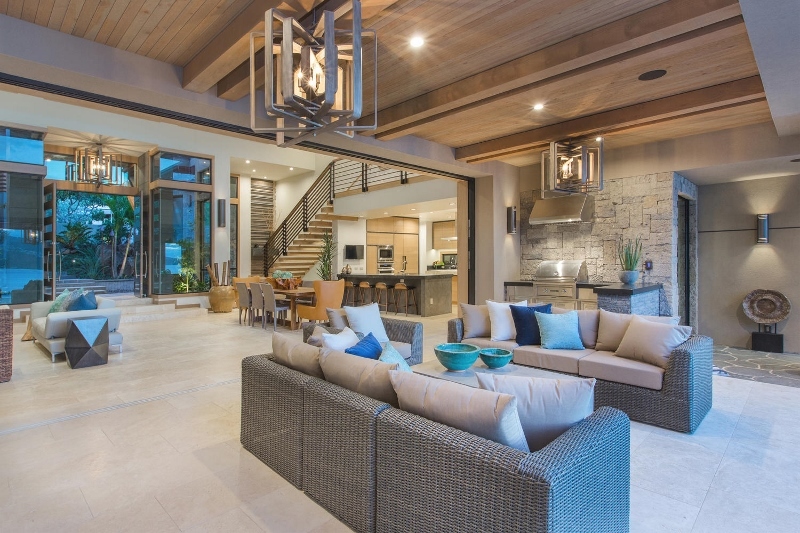 The builder’s trademark style was used throughout home and is quickly apparent with the round-about driveway, floating step entrance and oversized front door. 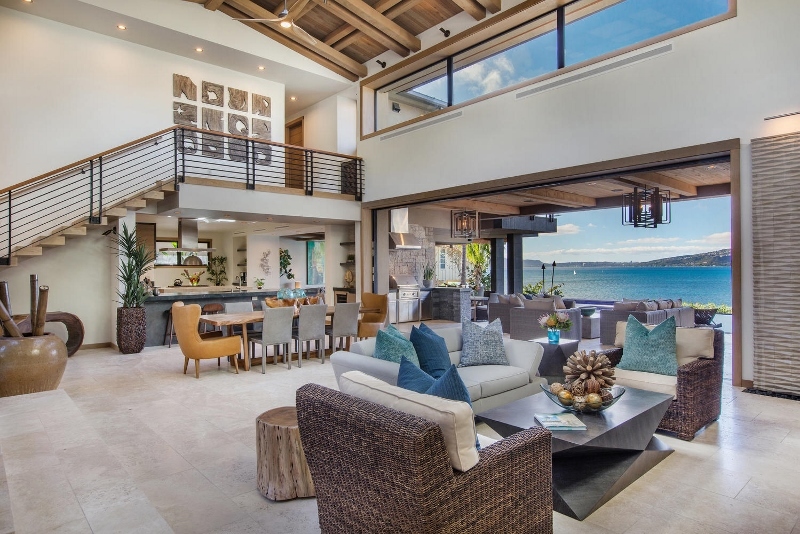 The grand room which is the center of the home, boasts 25-foot ceilings and endless ocean views. 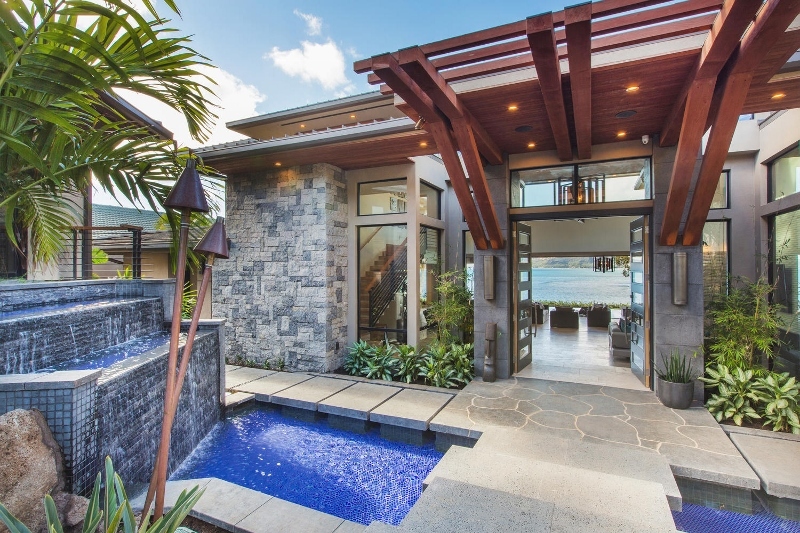 It’s indoor waterfall only adds to the already relaxing atmosphere. 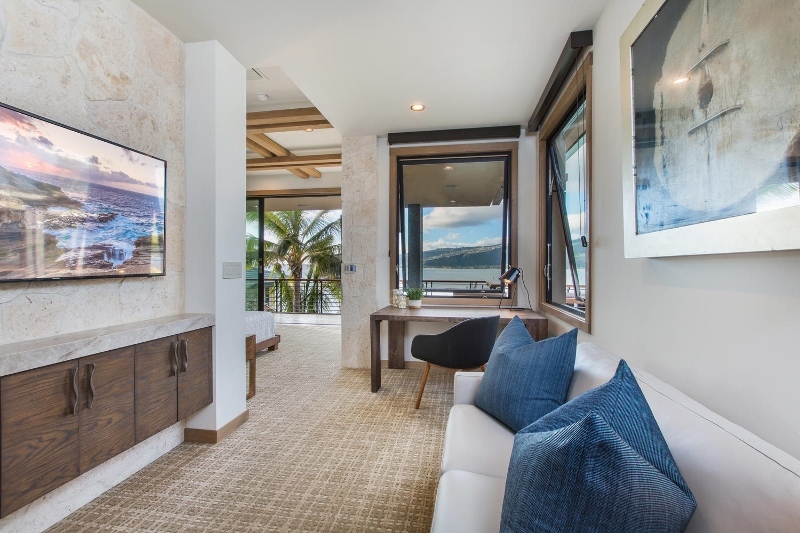 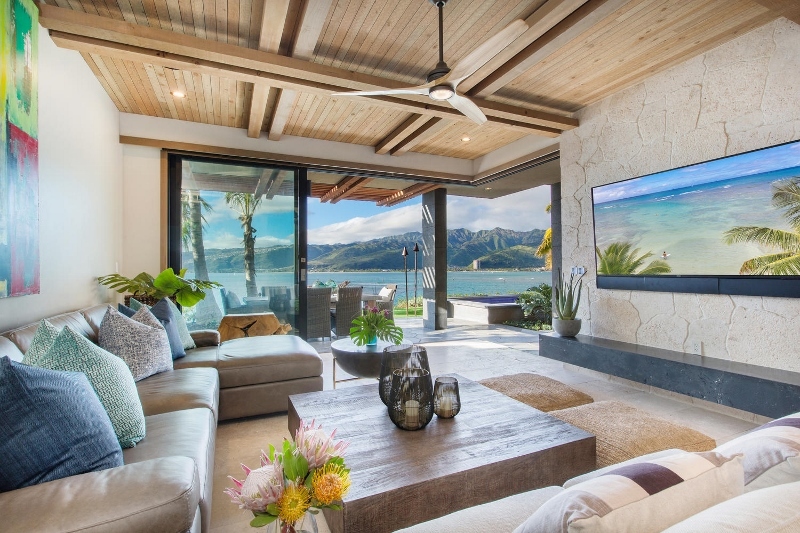 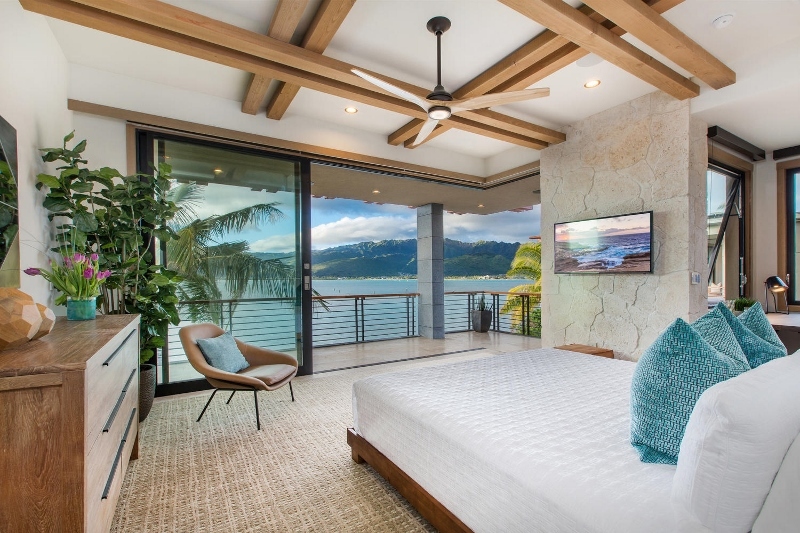 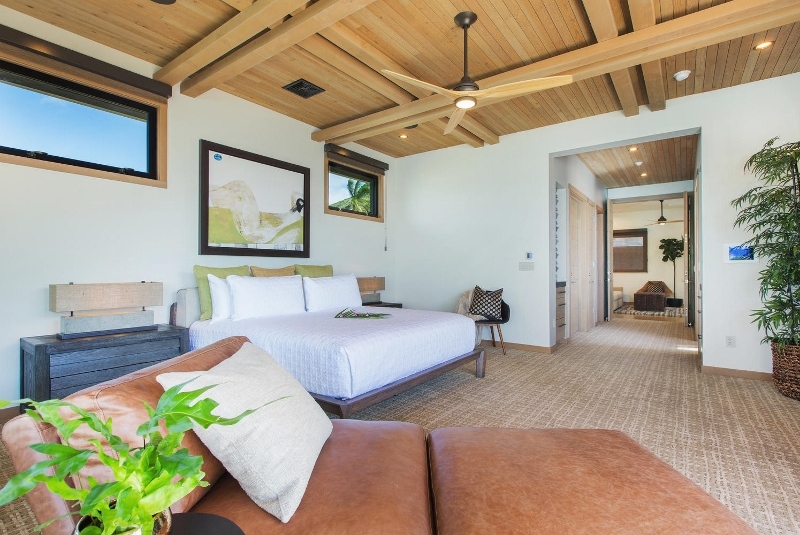 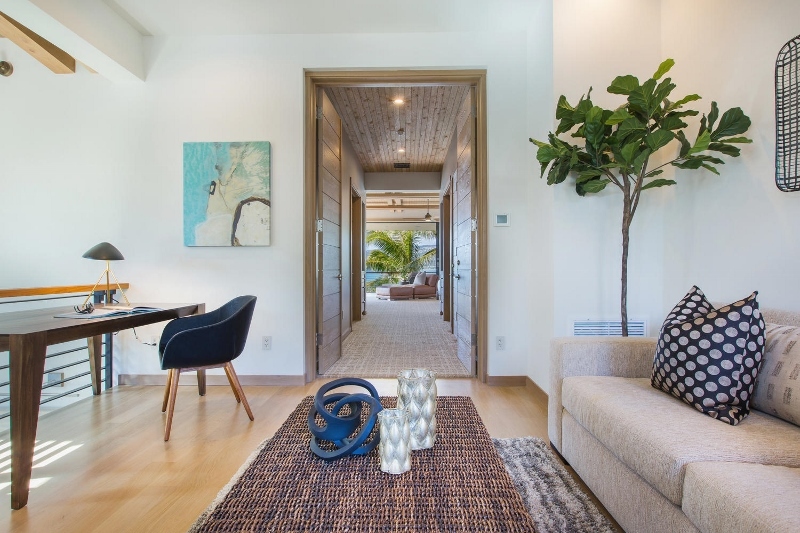 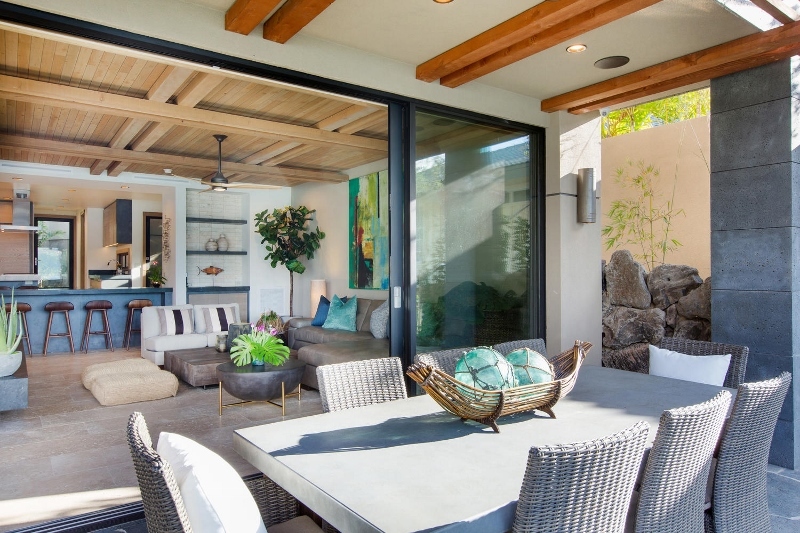 Designed for Hawaii’s signature indoor/outdoor lifestyle, the grand room’s doors pocket back entirely and open up the home to the outdoor lounge and ocean side yard. 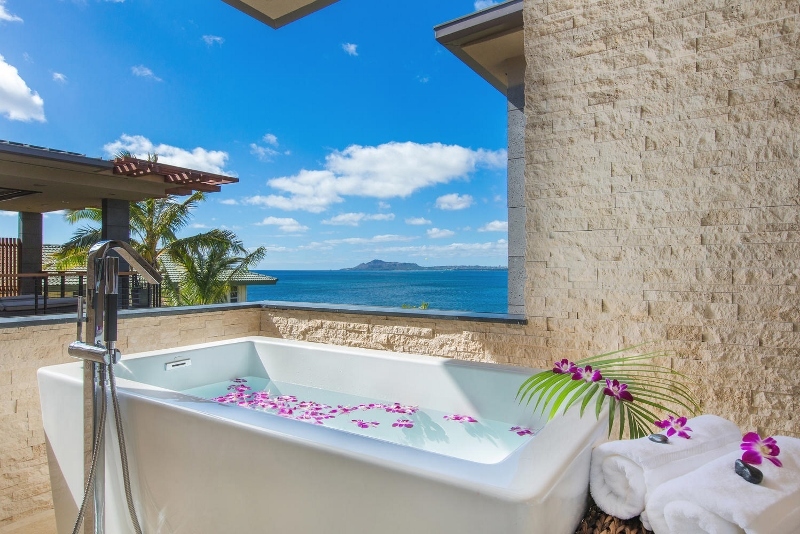 The infinity-edge pool and jacuzzi disappear into the horizon and pull the ocean even closer to you. 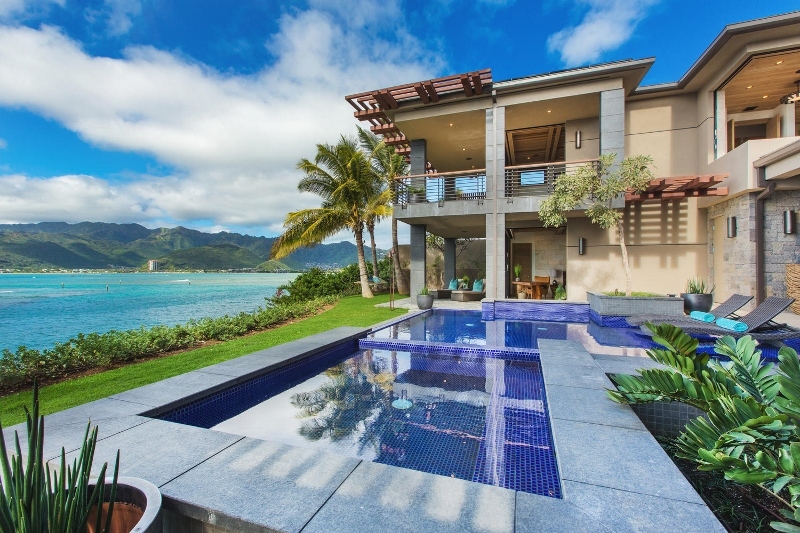 Beneath the ocean side yard is a hidden sand terrace with two chaise lounges. 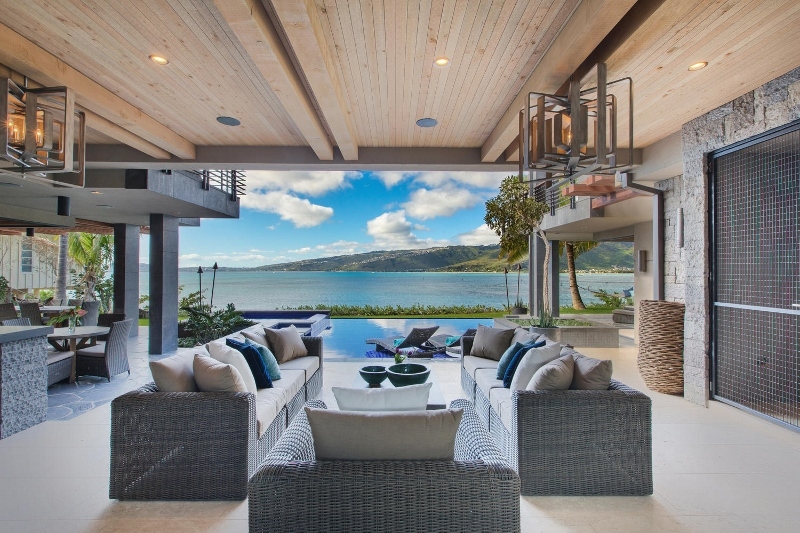 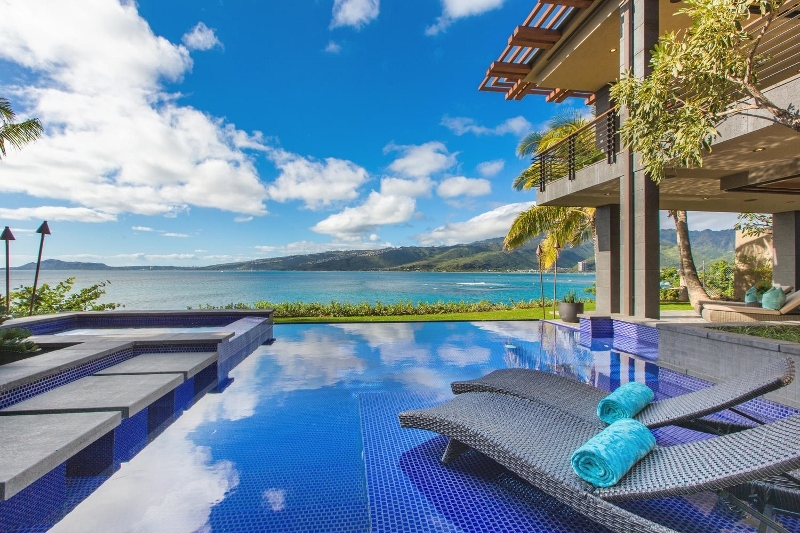 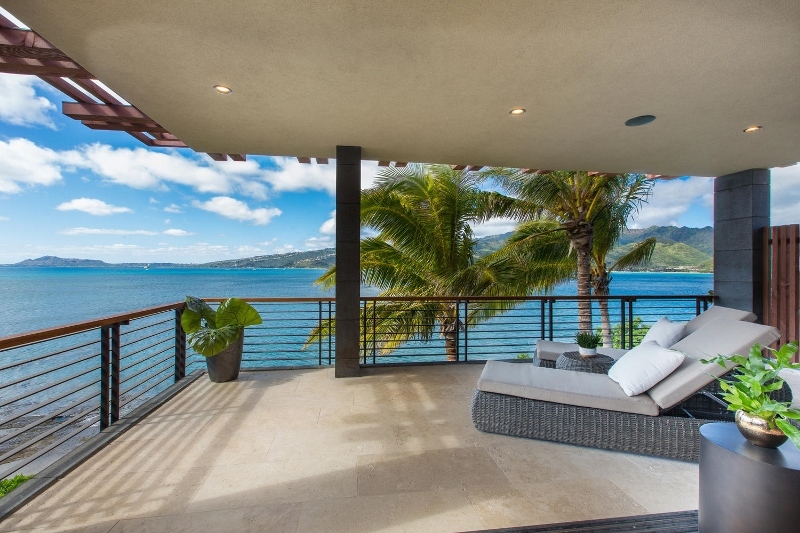 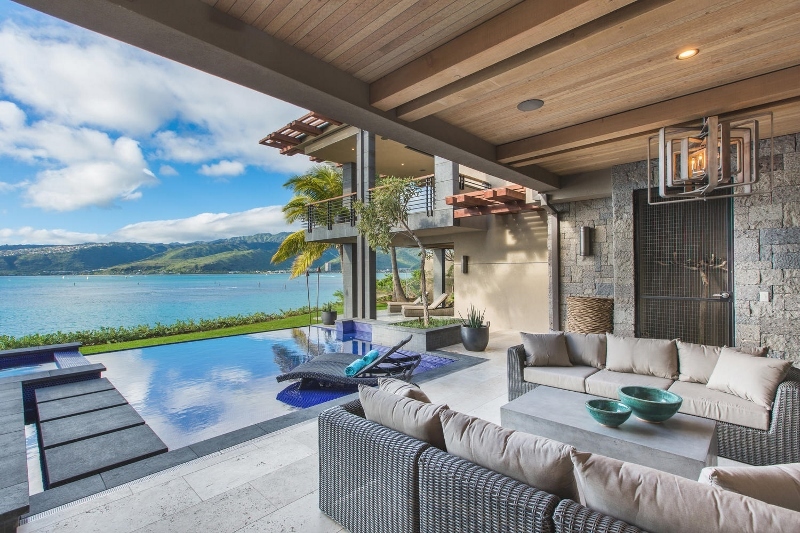 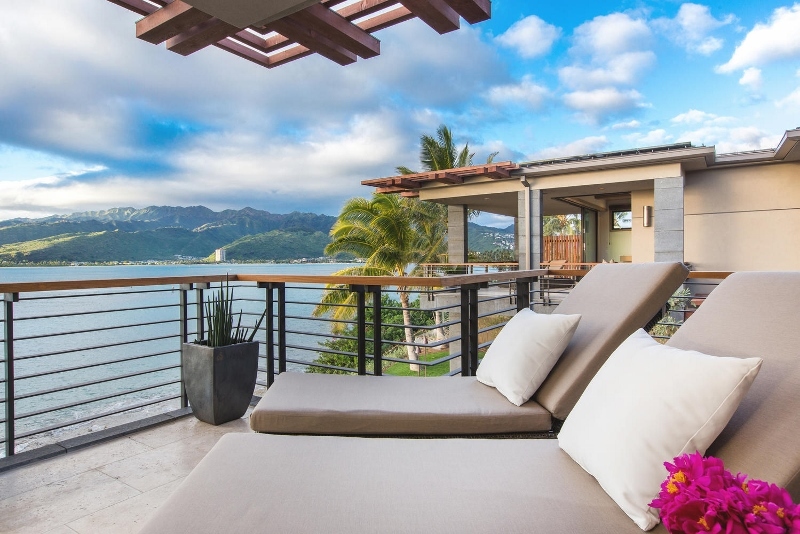 It is like your own private cove perched above Oahu’s most sunning seascape. 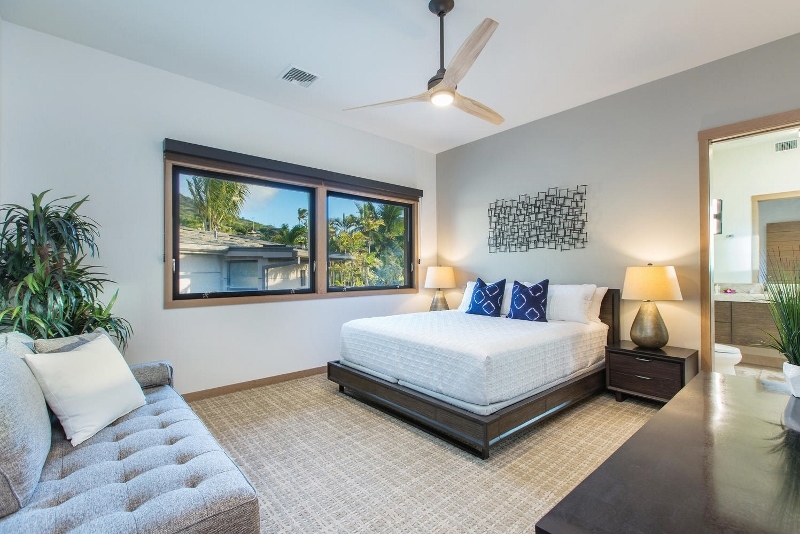 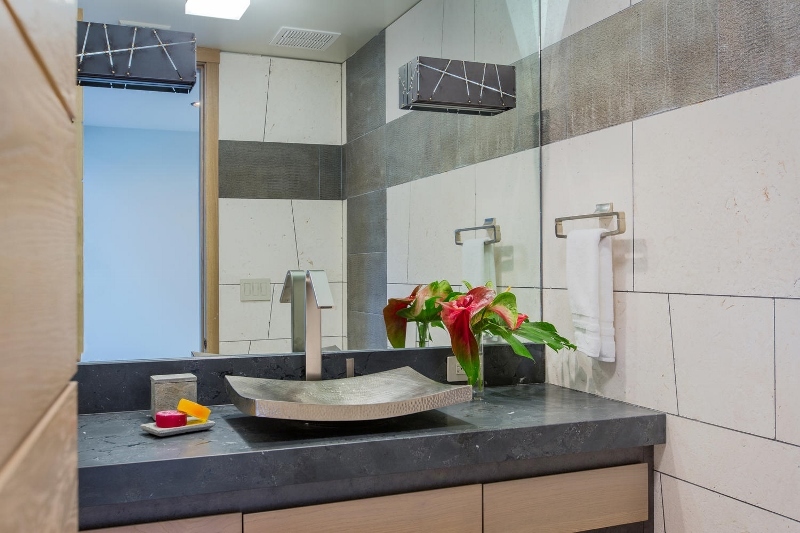 Just below the same terrace is your private ocean access to the Portlock tide Pools where dipping your toes and searching for hermit crabs, shells and colorful reef fish is only too fun. 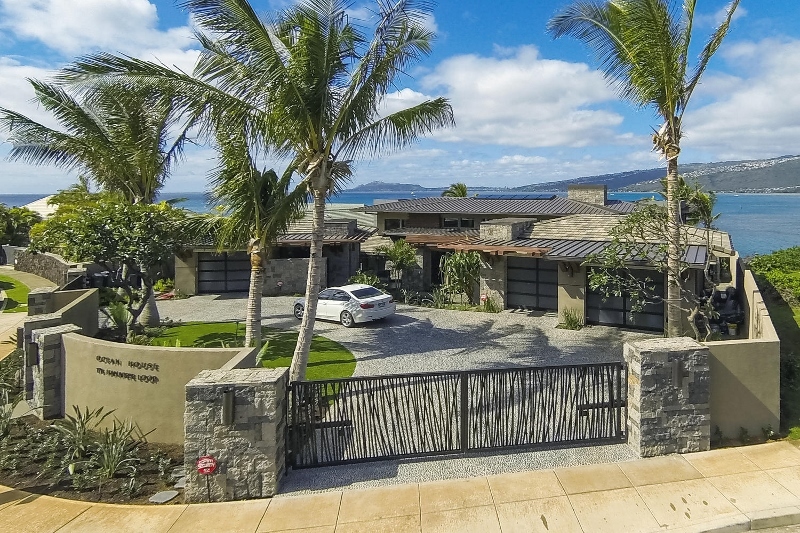 Located in south east Oahu, Portlock is a desirable, affluent neighborhood known for it’s luxurious estate homes with ocean views. 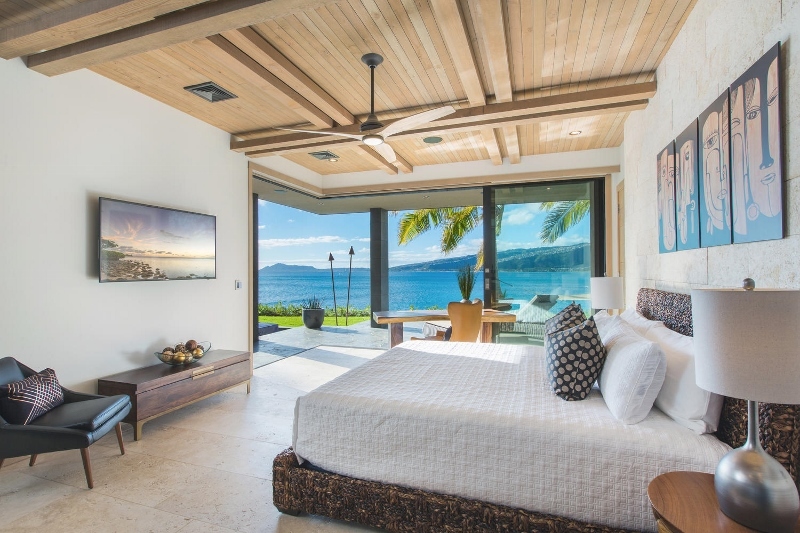 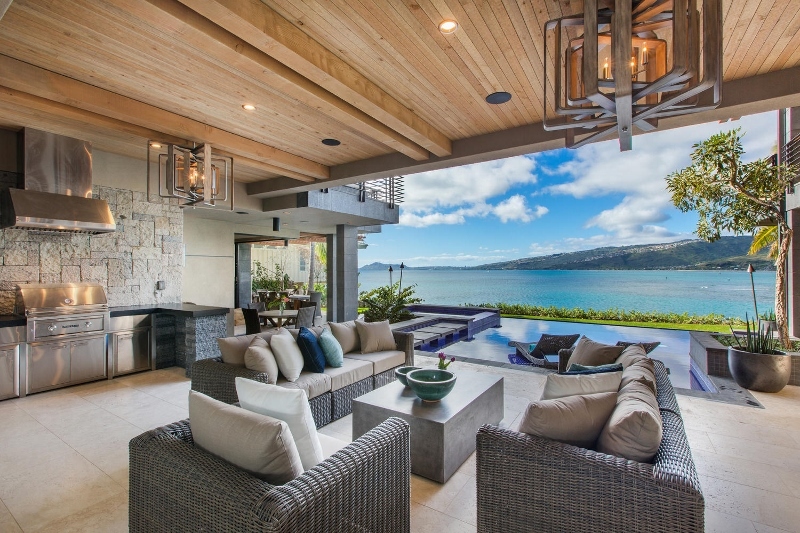 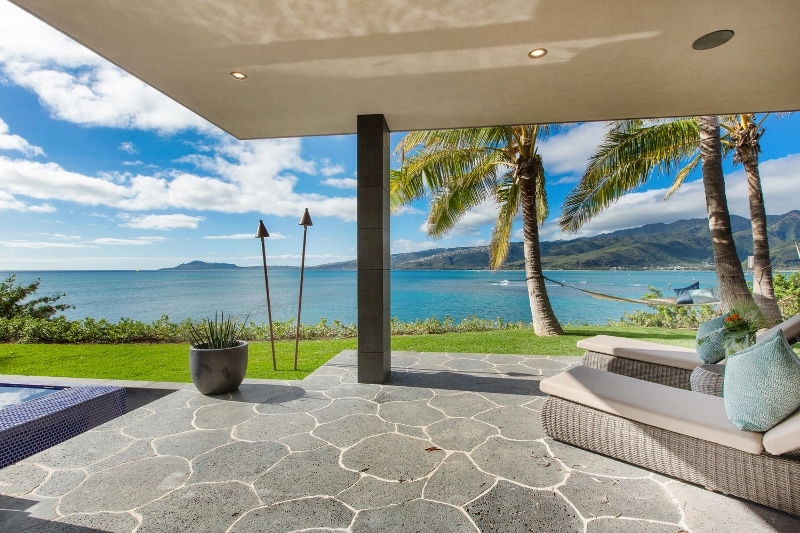 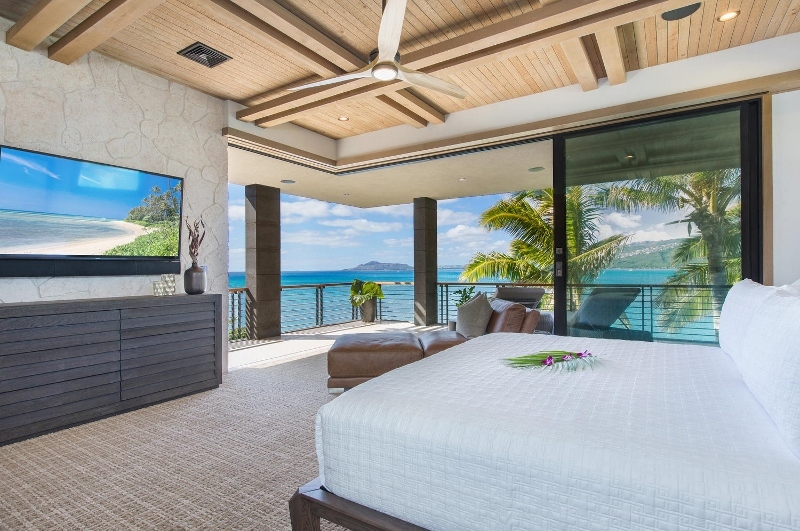 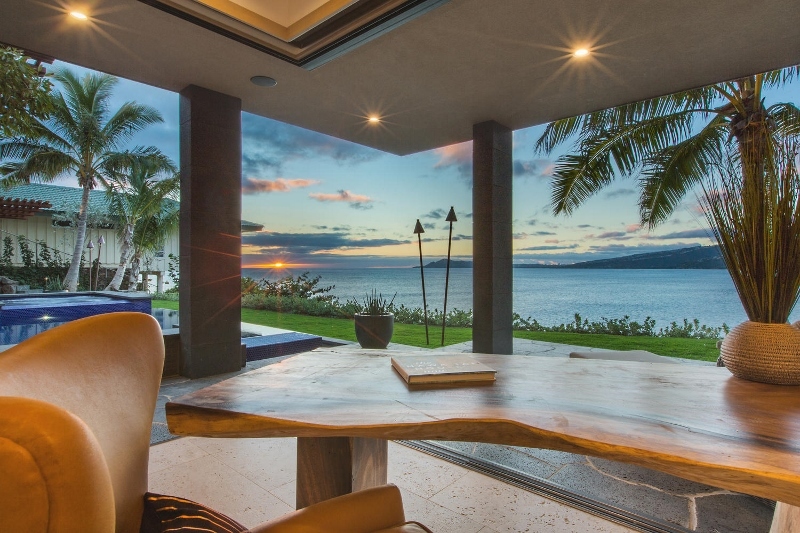 Overlooking Maunalua Bay, Portlock offers a unique perspective facing west where spectacular sunsets over Diamond Head can be enjoyed each evening. 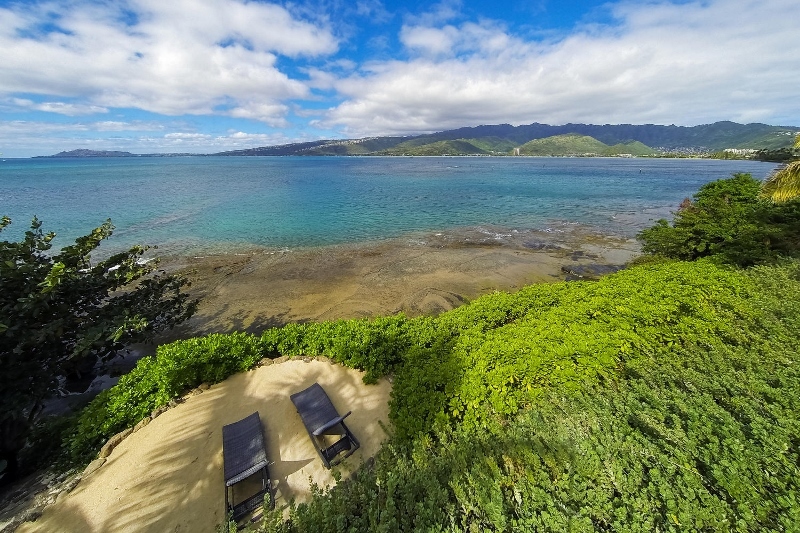 Though Portlock itself has no sandy beach, the famous snorkeling paradise, Hanauma Bay, is just around the corner. 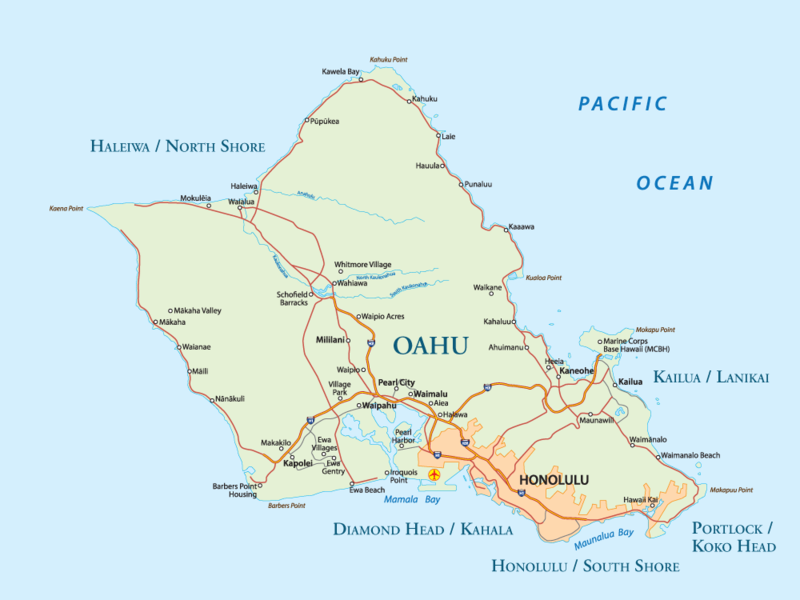 Also conveniently nearby is Hawaii Kai Town Center and Koko Marina filled with shops, eateries, adventure tour companies and much more! 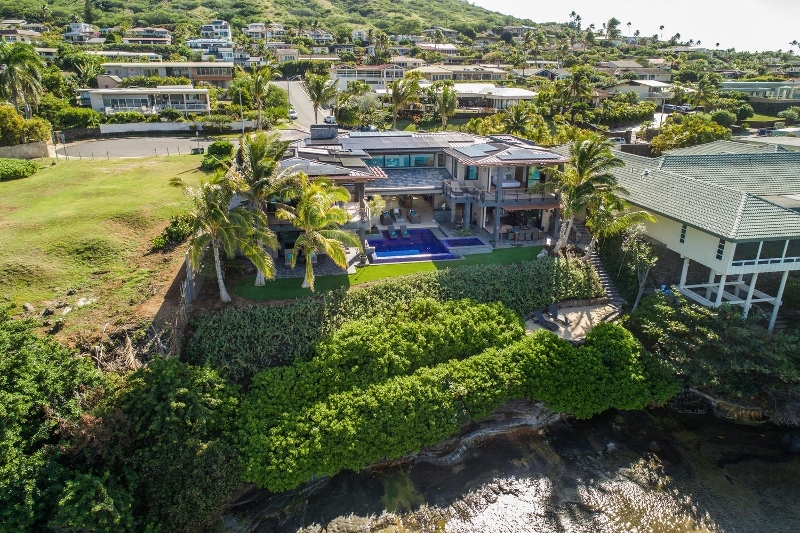 This neighborhood is perfect for a family that wants a little more space, a little more privacy and a more local island experience.